Fumbling Furret! Pokemon One a Day, Series 2! Today, we find the once squatty Sentret has emerged to be a snake cat thing, as far as ferrets and Furrets go! It's sort of a strange evolution, and one way or another, I wanted to get a tad bit fancy and artsy for the illustration of the day utilizing fun patterns! Furret is nothing fancy on it's own. Sort of a cute little thing, who abandons the scout theme of its previous form. That said, trying to make it interesting at first thought was going to be a chore. I originally thought to play with knots and it's fumbling and deceptively long body, and I set up a poses until I reached the one of today's piece. The form was down, but what about the style for the day? When it doubt, bust out word association. 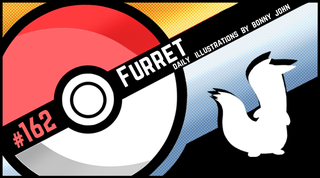 Well, FURret is a furry fellow, so I thought maybe I could present the fur in an interesting kind of way. When I looked at the features of the body most apparent, the stripes, I linked "fur" to "texture". Eventually, "texture" became "pattern". Everything from that point went along swimmingly. I used hard flats with light shading around the head and neck to pin everything down, and used a variety of patterns along the body of the creature to present an illustration that asks the user to spend an extra moment to observe the varying ornamental designs. And yes, that one solid bar was not left by accident or due to forgetfulness or carefulness. Solid as a decoration was left intended as a callback constant to the original stripes and very much carries its own voice in diversity of the elements presented. Who is your favorite normal type Pokemon, and why?